Kentish Town is situated north of Camden Town and has been long in the shadow of its more famous neighbour. However those in the know fully appreciate that Kentish Town offers a vibrant feel all of its own. Kentish Town Road is the home of many local shops and Restaurants. There are also good transport links into central London and other parts of the capital via the Northern Line Underground and London Overground stations. 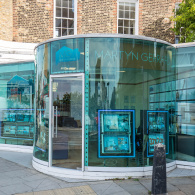 Martyn Gerrard Estate Agents in Kentish Town have helped a range of people find their perfect home as Kentish Town offers property with a wide variety of style, size, age and price.